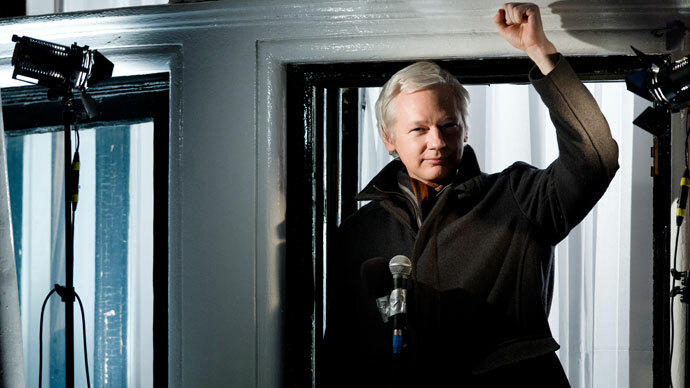 If Bahrain really wants to improve its human rights record, then it should free Nabeel Rajab, says Julian Assange. 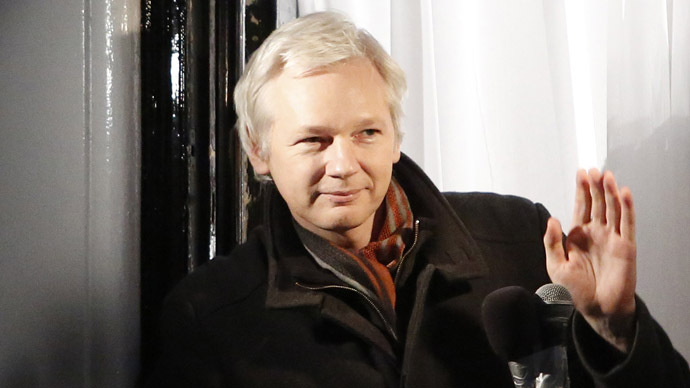 In an interview with RT, the WikiLeaks founder called Rajab the most prominent voice in the Bahraini Spring. Anti-government protests have been breaking in Bahrain since February 2011, resulting in dozens arrested and over 80 people killed. The protests have again intensified ahead of the Formula 1 racing event, resulting in violent clashes, arrests, and police using teargas on demonstrators including schoolchildren. Amnesty International has accused authorities of using the event as a platform to “show progress, with claims that the human rights situation has improved, whilst stepping up repression in order to ensure nothing disturbs their public image.” Nabeel Rajab’s tweets against the government and its bureaucracy, as well as the king, the PM and other top figures, back in 2012 were seen as an attempt to incite a revolution by organizing protests, and that was with what Rajab had been charged. “Well, I’ve got to go back. I’ve got to face these people. 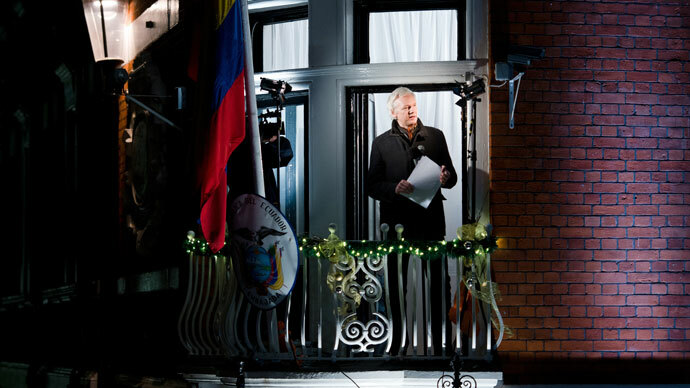 I’ve got to go back.” During the interview, the activist told Assange he had already been detained, kidnapped and beaten in front of his family due to his sharp criticism of the regime. While in prison, Rajab was subjected to inhuman treatment and degrading conditions, as he was thrown into solitary confinement on the first day of his imprisonment, according to his wife. He’s is solitary confinement, although he was supposed to be there for three months. Julian Assange said in the interview to RT that the key human rights figures in the region and a real force to call attention to Bahrain’s problems. RT:You interviewed Nabeel Rajab for your show the World Tomorrow on RT. Why did you invite him? 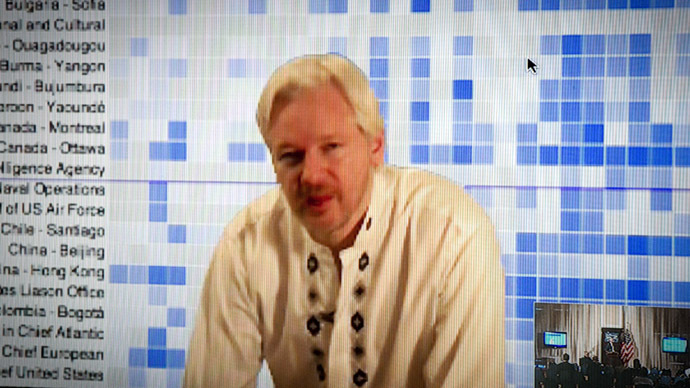 Julian Assange: Bahrain has 900,000 people. 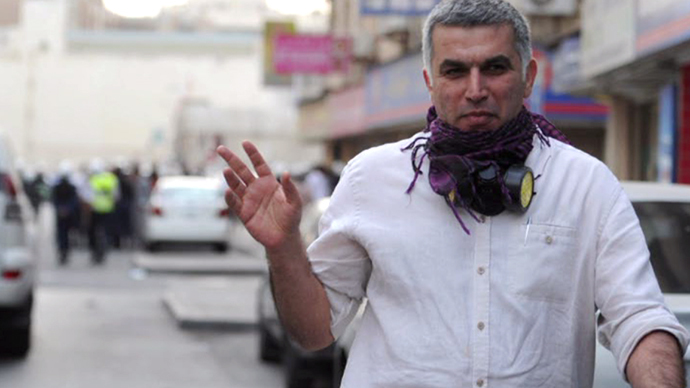 Nabeel Rajab has 150,000 Twitter followers comprised predominantly of the population of Bahrain. Since the arrest of a number of other activists in the Bahraini Spring in 2011, Nabeel Rajab became the president of the Bahrain Center for Human Rights (BCHR) and was the most prominent voice for the Bahraini spring. RT:What were your impressions of him? JA: Nabeel… a very courageous forthright man. On the show I asked him… Nabeel explained to me that as he was driving to the location in London – the secret location where I was under house arrest where we were going to film his interview – that he’d received a call saying that his house was surrounded by the police, from his wife. I said: “What are you going to do?” And he said: “Well, I’ve got to go back. I’ve got to face these people. I’ve got to go back.” And I thought to myself: “Um… doesn’t sound like such a good idea to me.” But he’s very much of the view that that is his homeland. That’s where his family is. That’s where his community is and his life is. Even though he was facing a risk – he would go back and face it. I mean as time goes by, his calculation may well be right. I mean what has happened to him, it’s a cartoonish form of despotism where he’s been sentenced to three years of imprisonment for a number of tweets in relation to bureaucrats and authorities, the king, the prime minister and so on - as well as organizing protests. It’s not like you see in more sophisticated regimes where you find a convenient excuse to put someone in prison. Here they wanted to make sure – very nakedly – what it was that the Bahraini regime didn’t want people to do. And what they didn’t want people to do is to criticize the regime. So they directly charged him for criticizing the regime. 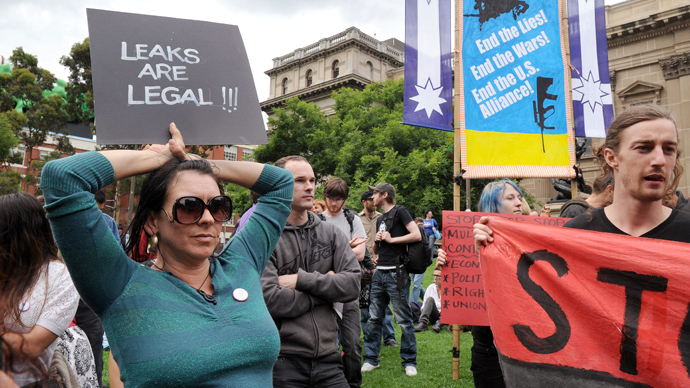 What they didn’t want people to do is organize protests and so they charged him directly for organizing protests. RT:What do you think Rajab’s prospects are now? JA: I think his long-term prospects are quite good. He has stood by the courage of his convictions. Even when he was imprisoned and then briefly released, he did not [give up] …. He kept the same stand of criticizing the authority. It’s hard to find people with that much courage, who can’t be a coward. So I think his long-term prospects are quite good, provided the international pressure keeps up. JA: Has been quite muted? It’s disgraceful and the British involvement is even worse. You had the former organizational chief of Scotland Yard coming over to Bahrain to help them control Bahrain in the same way that London is controlled in relation to police and control of demonstrations. The muted behavior by the United States has to do with the US naval base that’s in Bahrain. And geopolitically Bahrain is very close to Iran, it’s close to the straight where a lot of oil shipping is done. The US wants to keep its naval base in order to control this area. And that’s all. 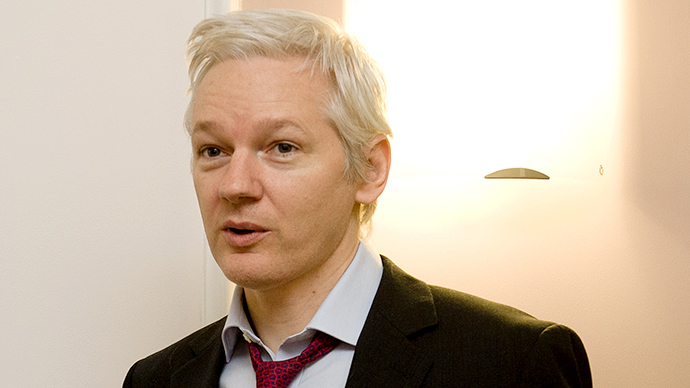 RT:You mentioned that it was almost a cartoonish imprisonment, which happened to Nabeel Rajab. Can you give an assessment of the regime in Bahrain altogether? JA: I was born in 1971. The prime minister of Bahrain [Khalifah ibn Sulman al-Khalifah] was put in power in 1971. RT:So, is there absolutely no democracy in Bahrain? JA: That’s the answer to your question. There’s 42 years this man has been in power in Bahrain. There’s no significant democracy. The Shia group is very significant, people argue – slight minority or a slight majority of the population, kept out of political life. The relationship between Bahrain and Saudi Arabia – the two countries face each other and they share a border with each other. And the Saudis are economically dominant to Bahrain, and are worried about any sort of resistance gaining power in Bahrain because the political movements in Bahrain have a habit of seeping over into the Saudi Arabia and into the Shia populations in Saudi Arabia. That’s why you saw during the uprising a desperate measure by the Bahraini regime of pulling in Saudi troops, to crack down on their own population. The Bahraini regime sold its sovereignty in order to crack down on its own domestic population. RT:You mentioned: “provided if the international pressure keeps up” in relation to Rajab. Do you think there’s been enough international pressure on the Bahraini regime? JA: There’s obviously hasn’t been enough in the West. I mean look at the example of the US and the UK. There has been some, and it’s interesting to look at what Bahrain has done in response. Well, it’s flown in Kim Kardashian and these other people, who will sell their soul to promote the Bahraini regime. You see Kim Kardashian putting tweet after tweet about how wonderful it is thanks to the sheik and so on. It’s disgusting. These people are disgusting. Everyone should know that their loyalties are for sale, similarly, with the Formula 1, exactly, the same thing. Bahrain has just bought that in order to cover up its human rights abuses and its bad reputation. There’s another way of dealing with things, which is – you can improve your reputation by actually stopping what you’re doing. Instead, Bahrain if it really wanted to improve its reputation it could release Nabeel Rajab. Until it releases Nabeel Rajab, no serious organization should have any involvement with the Bahraini regime. No organization who’s involved with Bahrain can be seen to be credible when Nabeel Rajab is in prison.